Wow! What an absolute dream come true this crazy little trip was for us. It had been a long time coming - well before we booked it back in April, we kept mentioning how incredible it would be to go over to the States to watch an NFL game and even better if we got to see our teams play against each other. We found out early this year that Carolina & San Francisco would be versing each other in San Francisco at some point throughout the season, however the only weekend we could have made it happen was if they were to play each other in the season opener game and we knew that that would have been pretty unlikely for it to align so perfectly. We could not believe our luck when we saw the schedule...it was meant to be! We booked the whole six day trip within a couple of hours. It was the most spontaneous/borderline irresponsible thing we have ever done, yet we didn't regret it once and it's a trip I'll remember forever. The lead up to leaving wasn't smooth sailing though. I didn't get clearance to fly from my OB until one week before departing. At my 20 week scan, they said I had placenta previa which (along with a billion more important & serious things) means it's not safe to fly. My doctor said that if the placenta has moved by 28 weeks then he will give me the all clear to fly. In that eight week wait I convinced myself that I wouldn't be going so I wouldn't be too disappointed. But when I found out everything was all ok, it was the biggest relief ever...getting the clearance to be able to fly was just an added bonus. Throughout the whole trip I was in a state of disbelief that I was actually there, it made me appreciate it so much and feel so so grateful that we got to share the adventure with our baby boy in my tummy. It's going to be the funnest story to share with him one day! 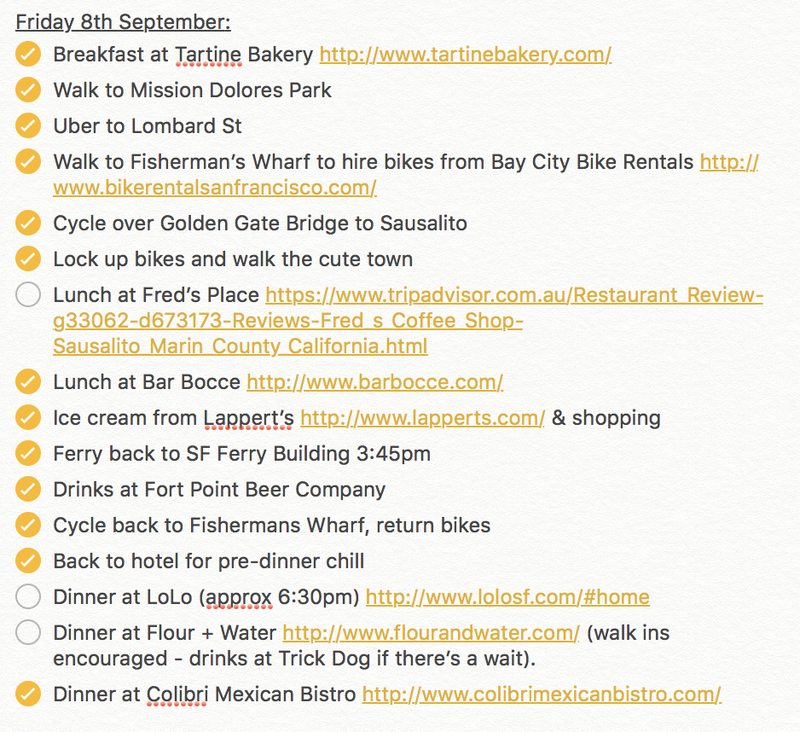 Above is the full itinerary I put together for our adventure (click to make the photos bigger). After landing on the Wednesday morning, we ended up having 2.5 full days in the city with a day trip to the Napa, Game Day and a trip down to Carmel before flying back home on the Monday night. We stayed at Grand Hyatt Union Square which was pure perfection for us. We loved the easy location and the hotel itself is beautiful with fantastic service! Such a great stay! 1. Flowers in the Ferry Building | 2. San Francisco perfection around Dolores Park | 3. NFL Fantasy banter between George & Ed at the best sports bar in the world; Golden Gate Tap Room | 4. The most beautiful view from the 35th level of Grand Hyatt Union Square. For Eddy's birthday dinner we went to Nopa which was such a highlight of the whole trip. The food scene in San Francisco is so amazing, I had a list a mile long of places I wanted to go to but with such a short trip & only so much food you can consume, we had to select only a couple. Nopa kept coming up in my research as a super cool spot with delicious food & great service so I thought it would be the perfect place to celebrate Eddy's birthday. I'm so glad we picked it! The vibe was amazing and every single dish we had was exceptional! We got there for 6pm and put our names down then went to Barrel Head Brewhouse before coming back for a table at 8.30pm. It was so worth the wait! 1. Great view of Alcatraz from the ferry back from Sausalito | 2. Delicious spread while wine tasting at Scribe winery up in the Napa | 3. G+E in Nob Hill | 4. Best vibe for the opening NFL game of the season | 5. We loved the convenient location of Grand Hyatt Union Square. 1 & 2. Cycling over to Sausalito | 3. Levi's Stadium | 4. Love the adorable cable cars | 5. Golden Gate perfection! We had such a great afternoon at Scribe Winery. I'd been wanting to go for so long and it definitely didn't disappoint (even though I wasn't tasting). The wine tasting experience is so different in the Napa compared to how it's done in all the wine regions we've been to in Australia. For starters it's incredibly expensive with most wineries charging $60USD just to taste (at wineries here, it's completely free to taste or maybe a $5-10 fee which comes off the price of a bottle of wine if you purchase one) however it means they really take the tasting experience above and beyond. It meant that we decided to only visit two places - Ma(i)sonry & Scribe and spend a couple of hours at each. We found that that was the way to do it anyway - with only having one day in the region, we didn't want to be rushing around everywhere. 1. Cycling through the fog covering the Golden Gate | 2. Being reunited with Megan after not seeing each other for four years was the best thing to come out of this spontaneous trip. We met through blogging when we both lived in Nottingham back in 2011!! Megan & her husband, Stephen, live in LA and as soon we booked this trip, they made plans to travel up the coast to meet us for a day trip in the Napa. The day couldn't have been more perfect, we really didn't want it to end. Sometimes I think it's the most cruel thing in the world to have best friends living so far away from us! | 3. Sausalito adorable-ness | 4. Cactus beauty at Scribe | 5. Tasting in the Maisonry patio was so so dreamy | 6-8. We all loved San Francisco's financial district! 1. On the ferry back to the city our adventure to Sausalito | 2. The market at the Ferry Building is really small and cute on Thursdays, but still full of beautiful flowers | 3. The hills are insane! | 4. Had to have at least one cable car ride! Game day! We had the absolute best time ever, even in the 36c sweltering heat! 1. SF buildings | 2. Cycling over the Golden Gate | 3. Beautiful grocer around the corner from Tartine Bakery | 4. We got a bus and felt like such locals! | 5. Sausalito beauty | 6. We had the best time at Maisonry with the amazing Anna. Also, Megan is just so beautiful! 1. Crazy hilly streets of the Nob Hill area | 2. It was so fun cycling over to Sausalito and then heading back to the city on a Ferry | 3. We had the most delicious lunch at The Slated Door at the Ferry Building | 4. Obsessed with everything about Scribe. Love the design so much | 5. The Panthers youngest Aussie fan haha! | 6. Gorgeousness in Carmel. 1. Delicious treats at the bakery in Carmel | 2 & 3. Our hotel room and the view. We stayed on level 5 and it had such a great view over Union Square | 4. We loved Fisherman's Wharf and all it's touristy-ness | 5. Ed enjoying his wine tasting at Maisonry | 6. Union Square at night. 1. Scribe Winery | 2. Waters for me all day haha | 3. Rivals | 4 & 5. Sausalito dreamy-ness | 6. Tartine Bakery | 7. The Painted Ladies at Alamo Square. 1. Nopa | 2. Breakfast at Jane's | 3. George & Ed on Carmel beach | 4. Archetype was so charming! | 5. San Francisco is such a beautiful city! 1. Breakfast at Tartine | 2. Beautiful produce on the street | 3. Blue skies at Union Square | 4. Dolores Park | 5. Our dinner spot in the Napa; Archetype in St Helena | 6. The ultimate sports bar food; delicious nachos! | 7. Beautiful Carmel on our last night before driving to the airport. It was the trip of a lifetime and we feel so lucky we were able to do it, it was meant to be! We love you SF! Cannot wait to be back!